Knitting, for me, usually involves a marathon effort to check the accuracy of one of my patterns and to finish a sample for a photo shoot. For the past few days, I knit for fun and pleasure. This hat was designed by the author of the blog, Golden Apples. She shared her pattern with me preliminary to putting it on Ravelry to sell. It is knit using a DK weight cotton. My daughter, Rachel (upper left), wants a pink one so I have a good excuse to knit another one. By the way, Rachel’s birthday is tomorrow and she will be old enough that she wouldn’t want me telling her age but I will say she was born in 1975. Since she is my youngest child, that gives away my age too. 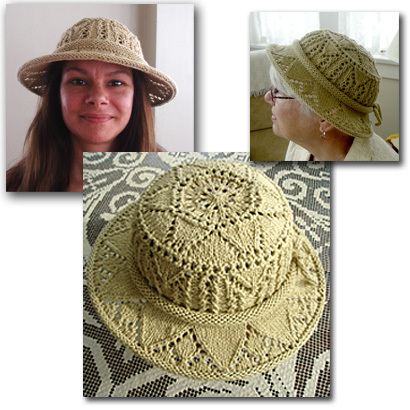 I would love to get the pattern for this hat. Is it available? She could tell you where and how to get the pattern. I love the hat! Wanted to tell you that I’m more than half-way on Mouse Tracks (row 426 to be exact) and am thinking of making another one, deepening the middle section so that the back of the shawl covers more of my back and maybe incorporating a “cats-paw” pattern into all that garter stitch. Seems like that would go well with all the mouse tracks. What a darling hat! I will look for it on Ravelry. Happy Birthday to Rachel. Lovely hat, Katherine. Had to share with you that my middle child and oldest daughter’s birthday is tomorrow. She was born in 1979…. I believe it’s also Prince William’s birthday. Thanks for the wonderful post.